For more professional development hover your mouse over the professional development tab on the menu bar above, or you can click below to access the information! 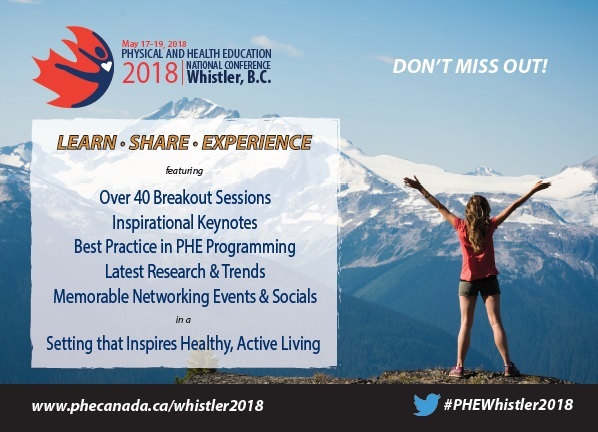 May 17-19, 2018 Physical & Health Education Canada will be hosting the 57th Physical & Health Education National Conference, in partnership with Physical Education in British Columbia (PE-BC) – bringing this professional development and research event to Canada’s west coast in beautiful Whistler, British Columbia. The event will feature the very best and latest trends in physical and health education research and practice. The Physical & Health Education National Conference will feature over 40 professional development breakout sessions, two inspirational keynotes, and memorable social and networking events for teachers, school administrators, academics, public health, government, and NGOs to learn, share, and experience the very best in physical and health education trends, programming, and practice. Click here to review last year’s Physical & Health Education National Conference Program Schedule. The Physical & Health Education Canada Research Council Forum, which precedes the National Conference, is an international event for researchers, academics, and other interested parties working in the physical and health education sector. Last year’s Research Forum featured an international mix of speakers and delegates including, Dr. Fiona Chambers, Dr. Ann MacPhail, Dr. Orla Murphy, and Cassandra Iannucci (Ireland); Dr. Brian Culp (United States); Dr. Kathleen Armour, Dr. Victoria Goodyear (United Kingdom); Dr. Dean Dudley (Australia); and several of our leading academics from here in Canada. Featuring multiple breakout sessions, panel discussions, and a sector leading Keynote, the event is not to be missed! Click here to review last year’s Physical & Health Education Canada Research Council Forum Program Schedule. Call for Research Forum Abstracts and Conference Breakout Sessions closes October 31st. Conference registration opens November 3rd. For more information, please visitwww.phecanada.ca/whistler2018 and check out the information linked below. Do you know of any upcoming professional development events? Share them with us in the form below!